Earlier this month the FAA released a map that set the stage for 7,500 surveillance drones to be flying in U.S. skies within the next two years. The FAA forecast that 30,000 surveillance drones will be in U.S. skies by the end of the decade. 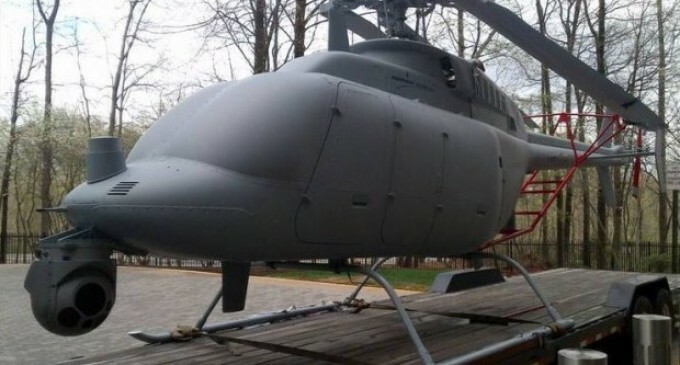 Northrop Grumman’s unmarked gray helicopter drone, the MQ-8C Fire Scout, is described as a “next generation” drone, has “three times the payload capacity of the current model in the military arsenal,” can remain airborne for twice as long and, of course, can be fitted with all manner of surveillance technology. With a little paint and a little altitude it would be hard to distinguish that from a regular helicopter, but I guess that is the point!